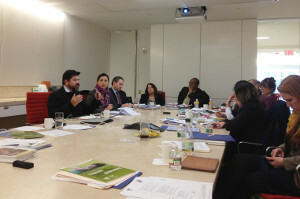 The First Meeting of the North American Council for Juvenile Justice (NACJJ), organised by the International Juvenile Justice Observatory, took place in December 2014. Representatives of public administration, civil society and universities from USA, Canada and Mexico were invited to Washington D.C. by the IJJO in cooperation with the Juvenile Justice Initiative and Civitas Law Centre at Loyola Law School of Chicago, and the Former Secretary of the Florida Department of Juvenile Justice. This inaugural meeting was attended by governmental representatives of the three states of the region, as well as the Organisation of American States (OAS) and team members of the UN Rapporteur on torture and other cruel, inhuman or degrading treatment or punishment. The IJJO was represented in this inaugural meeting by its Secretary General, Cristina Goñi, and its Director of International Affairs, Cédric Foussard. They were joined by Elizabeth E. Clarke, President of Juvenile Justice Initiative, as well as Wansley Walters, Former Secretary of the Florida Department of Juvenile Justice, and Diane Geraghty, Professor Director Civitas Law Center at Loyola Law School of Chicago, the event’s co-organizers. The initial convening of the North American Council was made possible thanks to the generous support of the Woods Fund of Chicago and the Butler Family Fund. A General Briefing was organised on the first day at the United States Senate in Washington DC to present the NACJJ to US officials, Senators and Juvenile Justice stakeholders. This official briefing provided an opportunity to spark the debate on the need for reforms of the Juvenile Justice Systems, and the possibility of further transnational cooperation. Then, hosted by DLA Piper Law Office, participants met to give a comparison and an overview of the existing juvenile justice systems in Mexico, Canada and the USA, in order to define priorities of action. The meeting’s sessions served to identify the areas of common interest within the region, leading to the exchange of experiences and good practices, and the discussion of potential collaborative projects. Building on this exchange and discussion throughout the conference, the meeting ended with the composition of joint objectives for the region, focusing on advocacy and training initiatives at all levels within the respective juvenile justice systems.